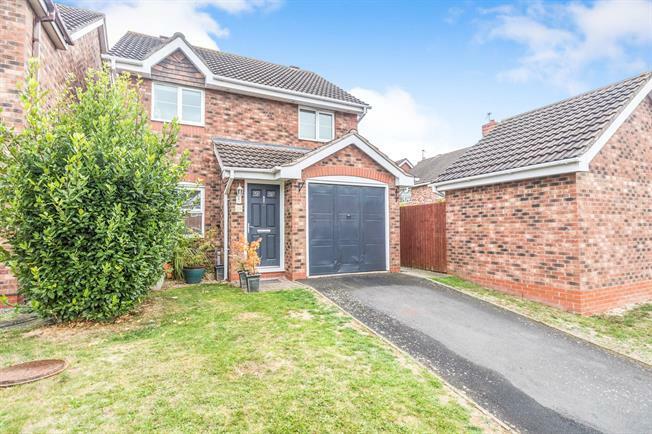 3 Bedroom Detached House For Sale in Worcester for Offers Over £260,000. This three bedroom detached home is located in a cul-de-sac position within a short distance of junction 6 of the M5. The property comprises of an entrance porch which gives access to the lounge with dining area. The lounge has a feature fireplace and the dining area has patio doors onto the conservatory. The dining area gives access through to the kitchen, which has been refitted. To the first floor are three bedrooms, two of which are double rooms and the bathroom. The master has an en-suite shower room which was refitted by the current vendor. The bathroom has also been refitted. The rear garden is laid to lawn and patio. There is a garage and driveway providing parking. The property is accessed via a part glazed door which leads to the hall. The hall has a window to the side aspect, radiator and Colonia flooring. 14'10 x 10'04 plus 13'5 x 10'7. Double glazed window to the front aspect, radiator, fire surround with electric fire inset with marble half, archway leading to dining room, stairs to the first floor, storage cupboard, arch to kitchen and patio doors through to the conservatory. Double glazed window to the rear aspect, door leading to the garden, a range of base and wall mounted units with work surface over, built in over with hob and extractor hood over, single sink unit with mixer tap and tiled splash backs, space for fridge/freezer and washing machine and Colonia flooring. Double glazed French doors leading to the garden, radiator and Colonia flooring. Double glazed window to the side aspect, wall mounted rad, airing cupboard, access to the loft and doors to all the rooms. Two double glazed windows to the rear aspect, radiator and door leading to the en-suite. Double glazed window to the side aspect, low level WC, vanity wash hand basin with tiled splash backs, shower unit and tiled flooring. Double glazed window to the front aspect and radiator. Double glazed opaque window to the rear aspect, low level WC, pedestal wash hand basin with tiled splash backs, panelled bath with shower over, heated towel rail and tiled flooring. The rear garden can be accessed via the kitchen and conservatory. There is a patio area which extends across the rear of the property and leads to a lawned area surround by mature trees and shrubs. The garden is enclosed by fence panels and has gated access to the front of the property. Driveway which offers parking for one car, to the side there is a lawned area which then has a pathway leading to the front door. Up and over door, electric and power.